On Ed Sullivan’s February 9, 1964 show, a mop haired quartet from Liverpool called the Beatles set music and culture aflame. In their wake waving the Union Jack came the Rolling Stones, Petula Clark, the David Clark Five and the Animals – to name just some. Grand House Party 17 BRITISH INVASION features the music of the Beatles, Rolling Stones, Moody Blues, Tears for Fears, Bee Gees, Gerry & the Pacemakers, Cat Stevens and many more from the 60’s to the 80’s. 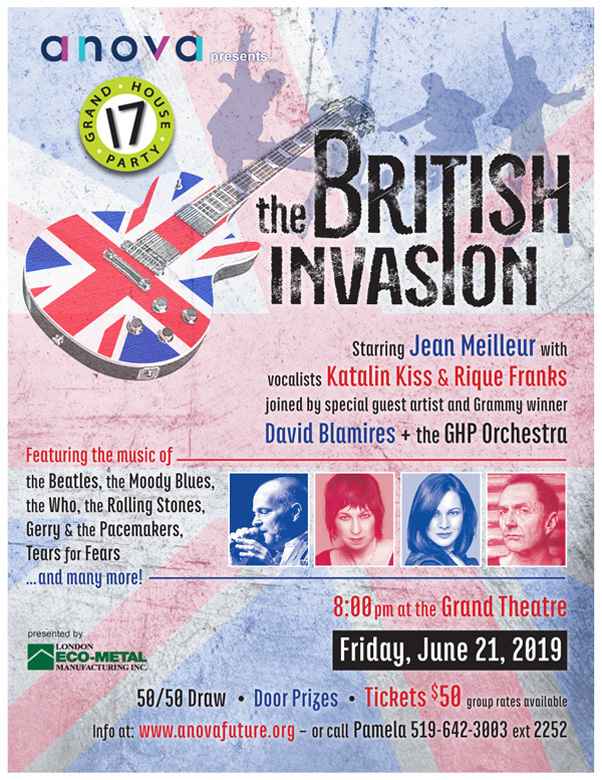 Joining Jean Meilleur on stage is multi-Grammy award winner special guest artist David Blamires, plus House Party fan favorites Katlin Kiss and Rique Franks. The incomparable Grand House Party Orchestra under the direction of Jeff Christmas features ace guitarist and fret-shredder Dave Dunlop, John Regan on piano, bassist Mitch Tyler and Lighthouse’s Donald Paulton on keyboards. And, the multi-talented Aaron MacDonald will lend his special sizzle to the horn section – and at the mic with a song or two. Prepare yourself for a power packed 20-song two-hour retrospective spanning three decades of Billboard’s top picks from across the pond that have stood the test of time . . . because . . .
Tickets $50 – on sale now! Hurry seats are going fast!